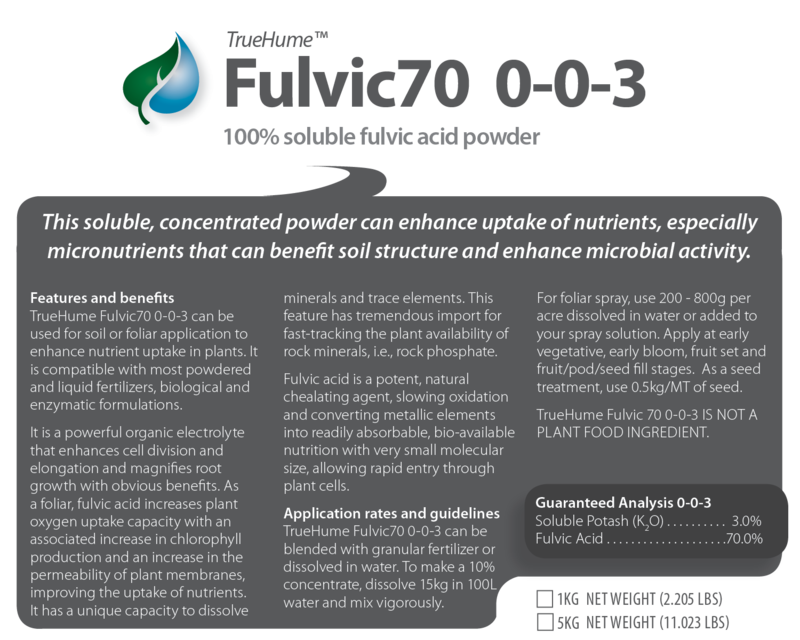 Fulvic acid is a very powerful input for any crop in any growing environment, including soilless greenhouse environments. With a CEC of 1400, fulvic acid is so powerful that one fulvic molecule is capable of carrying over 60 mineral and trace elements to boost cation exchange so your crops get access to more nutrients, maximizing nutritional potential. It stimulates plant metabolism, increases enzyme activity and acts as a catalyst in plant respiration. Category: Humates. Approved for Organics. TrueHume Fulvic70 0-0-3 is approved for organic production in Canada and the USA. Check with your certifer before using.